The DLLR/OUI 328 to Employees is an unemployment law poster by the Maryland Department Of Labor, Licensing and Regulation. This is a mandatory posting for all employers in Maryland, and businesses who fail to comply may be subject to fines or sanctions. This poster must be posted in a conspicuous place where all employees will see it. This poster describes how to qualify for unemployment and where to file a claim for unemployment. It appears you don't have a PDF plugin for this browser. 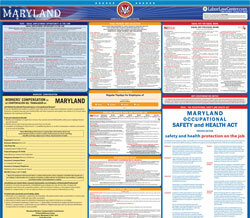 Please see the link below to download maryland-uibenefitposter.pdf. your wages for this purpose. reside or you may file a claim on the internet at the web site address indicated below. IF YOU ARE ELIGIBLE,	 you may be entitled to unemployment insurance benefits for as many as 26 weeks. promptly file a claim as instructed above, to determine your benefit rights. week you return to work regardless of whether or not you have been paid. 1. You are unemployed through no fault of your own. 2. You have sufficient earnings in your Base Period. 3. You have registered for work and filed a claim for benefits with a Department of Labor, Licensing and Regulation claim center listed below. 4. You are able to work, available for work, and actively seeking work. a complaint with the Office of Fair Practices, 1100 North Eutaw Street, Room 613, Baltimore, Maryland 21201.